With Prostate Cancer effecting 36,000 men in the UK and being a disease that is often embarrassing to talk about, never mind being diagnosed; support groups for those diagnosed with the disease are an extremely important tool in the fight against the disease. Kath Quinn, a CWU Union Safety Rep based in Blackburn and a key supporter of the NW BTU Health & Safety Co-ord, contacted Unionsafety in order to highlight both the issue of prostate cancer and the fact that a very important support group for those suffering from Prostate Cancer and their families, was being set up in her area. In mid 2010 NHS Urology Clinical Nurse Specialists mailed all the Prostate Cancer Patients within the East Lancashire Hospitals area, informing them that they intended setting up a Prostate Cancer Support Group within the Burnley area. The first meeting of the ‘new group’ was arranged for the 3rd November 2010. It was agreed that meetings should be held every month, - on the first Thursday of the month at Burnley Gen. Hospital’s Mackenzie Medical Centre. The support group name was chosen to reflect the geographical area covered; Burnley, Pendle, Blackburn, Hyndburn, Rossendale, Clitheroe, and Todmorden. 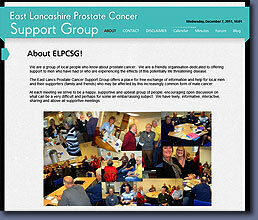 The EAST LANCS PROSTATE CANCER SUPPORT GROUP was born! The second meeting of the group took place on Thurs 6th January 2011 with 24 people attending. IT is intended for the 2012 meetings to be held at THE CONFERENCE CENTRE, PENDLESIDE HOSPICE, 2 - 4pm on the first Thurs of each month. The group’s aim is to help and assure men with Prostate Cancer that they are not alone and that they need not feel isolated. They can inform members about different types of treatments and where they can obtain medical advice. They regularly have Guest Speakers, mostly from the Medical Profession. Those attending the support group meetings are a very friendly bunch who all have the one thing in common – prostrate cancer. Every visitor attending the meetings is made to feel very welcome and to be part of the group. It offers men the opportunity to speak with other people about their Prostate Cancer, men who will have experienced the same as what they are going through. “It does no good burying heads in the sand!”, the group’s secretary told Unionsafety. “If a man notices unusual or uncomfortable symptoms he should not hesitate to have it checked by his GP, it is only a matter of having the simple PSA blood test. c) Men who are diagnosed with the disease and have had no Treatments or Surgery at all.